Beat first 7 ingredients in a large bowl with mixer until blended. Stir in chopped chocolate and 2 Tbsp. crushed candy. Pour into 2 (9-inch) round pans sprayed with cooking spray. Bake 35 to 40 min. or until toothpick inserted in centers comes out clean. Cool in pans 10 mins. Loosen cakes from sides of pans; invert onto wire racks. Carefully remove pans. Cool cakes completely. 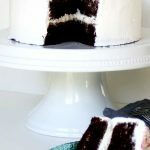 Fill and frost cakes with COOL WHIP. Sprinkle remaining crushed candy just before serving. Keep refrigerated.